You are here: Home / In Her Words / The Doctor is Out…..
No worries – he’s back already! Dr. Kline shares with us his personal experience as a surgical patient and what he has learned from being on the other side of the exam table that will enhance the personal care of his own patients. Three weeks before my surgery, everything was fine. I felt good, a little heavier at 56 than at 26, but still hale and vigorous. Then, while operating late one afternoon, I felt a pain in my groin. “Probably just too much strenuous exercise,” I thought, and dismissed it. It didn’t go away. The next day, it was worse. I felt a bulge. DAMN. I had a hernia. The whole concept of needing to get treatment, instead of needing to deliver it, was foreign and unsettling. For decades I’d been used to helping other people. Now, whether I liked it or not, I was potentially going to have to sit down and let others help me. I called the same general surgeon who fixed my 86 year old Dad’s hernia last year (why did mine have to come 30 years sooner?). He told me there was no danger in watching the hernia for a while, and that if I wanted to try and lose some weight it might get better, but it was a long shot. As it turned out, I didn’t actually have time to try and lose weight, because it started to get worse hurt towards the end of long workdays. I turned over all my long cases to my partner, and I started looking for the soonest, least disruptive time I could find to get it fixed. I greatly respect the people I work with daily, but I didn’t want to have surgery at the hospital where I usually worked, because I wanted things to be as routine as possible for everyone. I felt that it would be much less stressful on me (and probably everyone else) if I wasn’t in an environment where I was used to giving the orders. Fortunately for me, my wife is a surgeon, and she regularly works at a hospital I rarely visit. I thought this might be the best place to go – my wife could kind of “watch over” things, but I would not know anyone involved in my care personally. When I visited the surgeon for my preoperative appointment, he examined me and confirmed that I did in fact have a hernia. We discussed options, and decided to attempt a laparoscopic repair of the hernia. He advised me that it might turn out that it was too difficult to do the surgery laparoscopically, and that they might have to “open me up.” I assured him that after 20+ years of practicing surgery, I was well aware that things are not strictly predictable, and I asked him to please do whatever he felt he needed to at the time. This was the first time I started to “loosen up” a little bit, and I was actually kind of glad that it would be him, and not me, worrying about the details in surgery that day. I also found out in his office that I had high blood pressure, for which they put me on medication. I began to limit my salt intake, and cut back on calories. Fortunately, jogging did not aggravate the hernia, so I also increased my aerobic exercise until two days before surgery. Yes, I was “in training” for this. On the night before surgery, I went to bed early, woke at 2 a.m., and didn’t sleep the rest of the night. 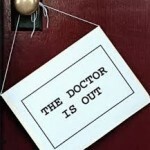 Loved the article “The Doctor is Out…”! I can relate to being in training for the surgery. Before Dr. Craigie could do my reconstruction, I needed to loose 10 pounds. I started exercising and dieting so I could have the reconstruction surgery. The results of the surgery made it worth the training. I look forward to reading the remaining parts of Dr. Clines story. Thanks for your comment Darrell – glad you enjoyed the article. Hope you and your husband are doing well!